World Famous inks are trusted by some of the most sought after artists around the world. They proudly back these superior tattoo inks because artists know that they'll deliver a bold, strong design each time they work with World Famous. With over 50 colors to choose from, there is a color for every job. Every bottle of World Famous Tattoo Ink is sterilized using gamma ray radiation then sealed in a crystal-flex bottle. This ensures that each bottle is free of any microorganisms and completely safe. Rest assured knowing that the labels on each bottle are tamper-proof and waterproof for your convenience. They are super portable and TSA-approved making them the ideal choice for artists that are on-the-go. The inks contain no animal products and are never tested on animals. They meet the requirements for the vegan community and comply with EU quality standards. Vegan tattoo inks can be better for immunity and health, easier on the skin and longer lasting. Vegan tattoo shops from all outfit their shops with the full line of World Famous inks. World Famous has over 50 years of experience tattooing. The brilliant minds behind World Famous strive the be the best, day in and day out. Through relentless dedication, years of research and surrounding themselves with the best chemists and cosmeticians they have crafted the purest, highest-quality tattoo inks on the planet. PREMIUM TATTOO INK - Many of the most popular tattoo artists around the globe turn to World Famous' bold, beautiful inks to deliver a flawless work of art. VEGAN AND SAFE ON SKIN - These high-quality tattoo inks contain no animals products and are never tested on animals. They are all vegan-friendly and comply with EU quality standards. GAMMA STERILIZED - These inks are ultra-safe and pure. All World Famous tattoo inks are sterilized utilizing gamma ray radiation then sealed in a crystal-flex bottle. 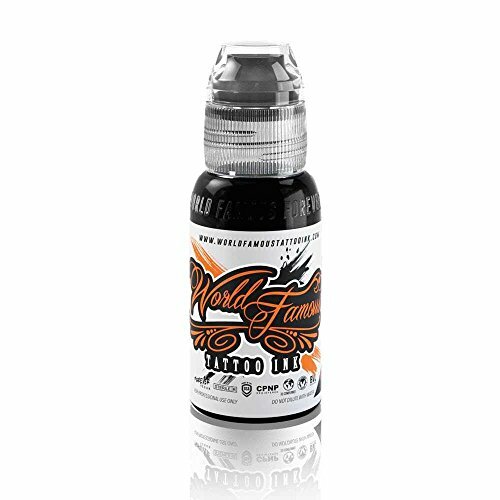 CONVENIENT BOTTLE - Each bottle of tattoo ink comes with a tamper-proof and waterproof label. When you are finished with an ink, use the twist cap to securely seal the bottle until your next use. PROUDLY MADE IN AMERICA - World Famous strives to create the finest tattoo inks in the industry. With over 50 years of experience and relentless dedication they achieved their goal. If you have any questions about this product by World Famous, contact us by completing and submitting the form below. If you are looking for a specif part number, please include it with your message.